PERSONAL PRIESTHOOD CERTIFICATION IS THE ONLY TRAINING PROGRAM THAT OFFERS OVER 1000 LESSONS ON YORUBA HOLISTIC HEALING. GET AN EDUCATION THAT WILL EMPOWER YOU TO LIVE THE MEDICINE THAT WILL HEAL YOUR LIFE AND HEAL THE LIVES OF THE PEOPLE YOU ARE DESTINED TO SERVE. DOWNLOAD THE CATALOG. As a result of the sudden growth of Orisa Lifestyle, the tradition is in the midst of an undeniable crisis: Too many people think they must be initiated before they can make any contribution at all. This is contradictory to Orisa Lifestyle, which actively integrates herbal medicine, nutrition and scores of other modalities into the healing process. In addition, economic pressures have driven the cost of services through the roof and limit the amount of time priests can spend with clients and students. Consequently, many voices are rising up as the public is calling for reforms, which include more affordable treatment. A new paradigm must be embraced in order to address all aspects of this dilemma. It is clear that Ifa and Orisa priesthood have created vastly greater access to divination, initiation and title taking, but the emphasis on beads, pots and titles, to the exclusion of other - very important - elements of healing has also served to limit the development of a model that truly optimizes Orisa Lifestyle. Beads are not enough. Pots are not enough. Titles are not enough. Charms are not enough. Power is not enough. At the same time, exercise is not enough. Higher education is not enough. Nutrition is not enough. What you are truly seeking can only be discovered holistically, from the inside out. As long as you refuse to understand the fact that your DESTINY is enough, you will be limited by some form of SPIRITUAL CRISIS. Personal Priesthood is the antidote to spiritual crisis. More exactly, you demonstrate your Personal Priesthood by CONSISTENTLY and FAITHFULLY making decisions that honor your destiny before anything else. Self Discovery: Study sacred texts. Observe, accept and realize your natural gifts and talents. Personal Rituals: Perform daily practices that refine your natural gifts and talents, with special focus on their divine essence. Sacred Service: Mastering your natural gifts and talents in service to the people and causes that matter most. ​Starting September 2017, the Orisa Lifestyle Academy will offer three categories of Personal Priesthood Certification: Mentors, Catalysts and Counselors. The Certified Personal Priesthood Mentor, Catalyst and Counselor are essential members of the Personal Priesthood movement. The objective of Personal Priesthood Certification is to share a viable process for successfully transforming your life and overcoming challenges through your Personal Priesthood practice — a process known as living the medicine — and inspire others to do the same. 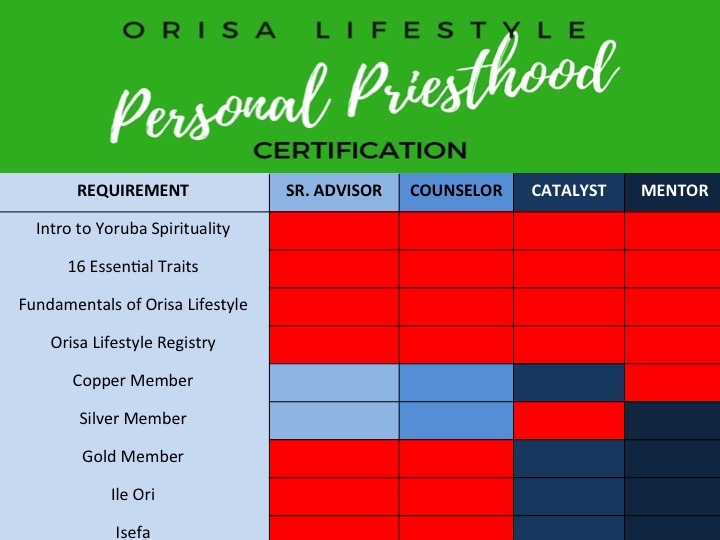 Join the Certified Personal Priesthood Registry: ​Becoming Certified in Personal Priesthood you'll be the local Orisa Lifestyle Academy representative. When people in your area express interest in Orisa Lifestyle, they will be directed to you. Governed by a professional body with a disciplinary board and code of ethics. You must be in good standing with your professional organization. Facilitating psychological/educational work must fall under the scope of what you are trained/licensed/certified to do by your profession’s governing body. Chronic and persistent identity crisis represents the epidemic of our generation. People desperately need spiritual and lifestyle guidance to restore the divine right of destiny. That’s where YOU come in. With a Personal Priesthood certification through the Orisa Lifestyle Academy, you will have the knowledge and skills to help yourself, your clients, friends and families live the medicine that will heal your lives and heal the lives of the people you are destined to serve. ​The objective of the #PersonalPriesthood movement is to create 16 generations of social, economic, environmental and cultural wellness. More specifically, Personal Priesthood seeks to help you live in ways that are more consistent with your heavenly mandate. If you're like many people today, you struggle to discover and actively pursue your life's purpose. You may have earned a degree, travelled the world, been initiated to various orisa and raised a family, but you still haven't started your life's work; you still don't know your destiny. The Holy Odu IrosunOse says, A kunle a yan eda; A daiye tan oju n yanni. We kneel and choose our destinies in heaven; it's when we meet the World that we become impatient. It means that your prenatal choice is the basis of your life experience. Here, it's essential to emphasize the fact that you are not your thoughts. You are not your words. Your actions and your habits do not define you. They are merely refractions of your divine spark! The real you is the one who CHOOSES your thoughts, words, actions and habits. In this regard, Personal Priesthood begins when you stop chasing afterthoughts and start making decisions that are more consistent with your original choice. Now is the time to take action toward accomplishing your dreams and aspirations. Personal Priesthood Certification will prepare you for an transformational experience that will open new and exciting opportunities. What is Certified Personal Priesthood? A Certified Personal Priesthood Practitioner is a supportive guide who works with people to help them feel their best through spiritual and lifestyle changes. Beyond performing standard rituals or seeking certain titles, Personal Priesthood Practitioners support individualized treatment plans to meet their clients' developmental needs. How is Personal Priesthood Certification Unique? Relationships, exercise, financial wellbeing, and environmental sustainability are just as important to your spiritual development as the religion you practice. Certified Personal Priesthood Practitioners understand this and take a holistic approach to supporting the whole person. Find out how Personal Priesthood stacks up against other approaches to Orisa Lifestyle. Why is Personal Priesthood Certification Necessary? As an Orisa Lifestyle Academy graduate, you will receive the most comprehensive training in Yoruba spirituality, coaching skills, and integral healing there is. If you are initiated or not, it is absolutely necessary that you discover your natural gifts and talents so that you can fully devote yourself to living the medicine that will heal your life and heal the lives of the people you're destined to serve. The priests and human services professionals don't always have the time or resources needed to help their clients cultivate habits associated with a divine lifestyle. 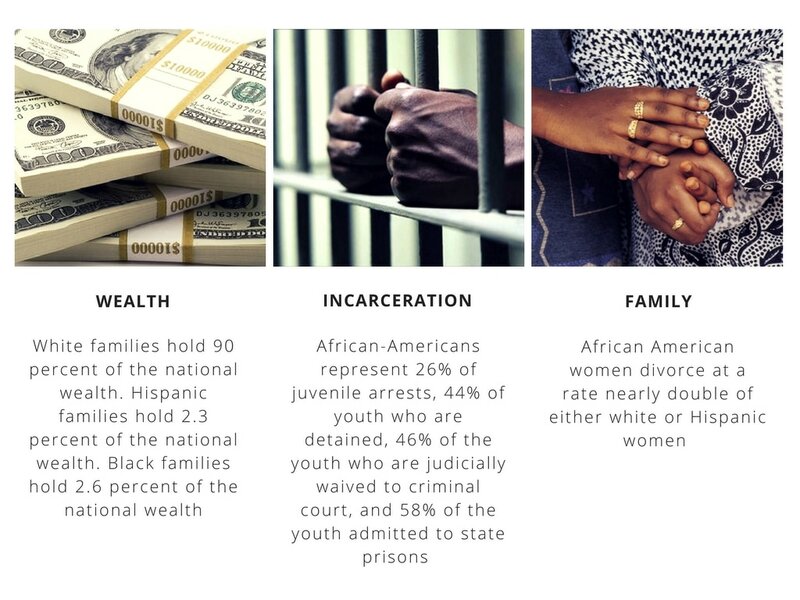 Based upon the growing interest in Orisa Lifestyle, in conjunction with the range of contemporary social problems our community is facing, it is estimated that over one million new Personal Priesthood Practitioners will be needed to support the demand for spiritual development in the United States by the year 2020. More precisely, Personal Priesthood Practitioners are needed to fill the social, cultural, economic and political void in our current spiritual systems. Delve into why understanding self and others is the key to spiritual development and productivity. Learn proven models for delivering on the Ancestral Promise. Simplify complex issues of spiritual identity. Identify specific communication strategies to use to discuss Orisa Lifestyle. Develop treatment plans for a variety of personal outcomes, including health, prosperity, intimacy, conflict resolution, leadership, and spiritual discipline. A Certified Personal Priesthood Practitioner is a supportive mentor who helps people shift their behavior towards healthier habits. Whether the goal is weight loss, improved family relationships, stress reduction, or financial growth, Certified Personal Priesthood Practitioners support clients to create sustainable lifestyle change. As awareness shifts towards the importance of lifestyle, Personal Priesthood fills a void in the current paradigm or Orisa Lifestyle. Most ritual specialists lack the time and resources to help patients, students or godchildren perform all the little adjustments necessary to achieve their destinies. By addressing all facets of spiritual development – ritual, relationships, career, physical activity, nutrition, etc – Certified Personal Priesthood Practitioners take a holistic approach to Orisa Lifestyle and help clients find the unique approach to living the medicine that will heal their lives and heal the lives of the people they are destined to serve. Personal Priesthood Certification enables you to organize and package your natural gifts and talents so that you can generate viable sources of revenue with your entrepreneurial skills. All of your lessons, discoveries and techniques can be passed down to future generations. As a Certified Personal Priesthood Practitioner, you will have the ability to create the work you love, as it emanates straight from the heart of your ancestors. You can draw upon the collective wisdom of your culture in order to bring out the best in your lineage. As a Certified Personal Priesthood Practitioner, you call the shots. You have the power to create your own schedule and see mentees or clients on days and at times that work for you. You can take one anytime you want.